Sampach used to get up at 4:30 a.m. every morning to open his supermarket in Iraq. Within 24 hours of being told by ISIS to convert, pay up, or die, he left his supermarket and chicken farm behind and fled with his wife and children. Their journey took them to Greece, where for months Sampach had to restlessly idle his days away while waiting for the call from the UNHRC for the completion of their resettlement. But, at least they were safe from the violence and threats. Sampach’s is just one of the many stories I had the opportunity to hear during my visit to Greece last month. I travelled there with Rev. Al Tricarico and OPC deacon Bob Fales to visit the various regions where the Greek Evangelical Church (GEC), a reformed Presbyterian denomination, is actively carrying out a ministry of Word and deed to the refugees passing through Greece. The future of the refugees in Greece is uncertain. What is certain, however, is that the providential hand of the Lord has placed thousands of refugees within reach of various GEC congregations. These churches have sought to be faithful stewards of this opportunity, often going far out of their way to help out. The ministry began in August 2015 when refugees on their way to Germany began to back up on Greece’s northern border in a small forgotten border-crossing called Idomeni, about 30 minutes from Milotopos. 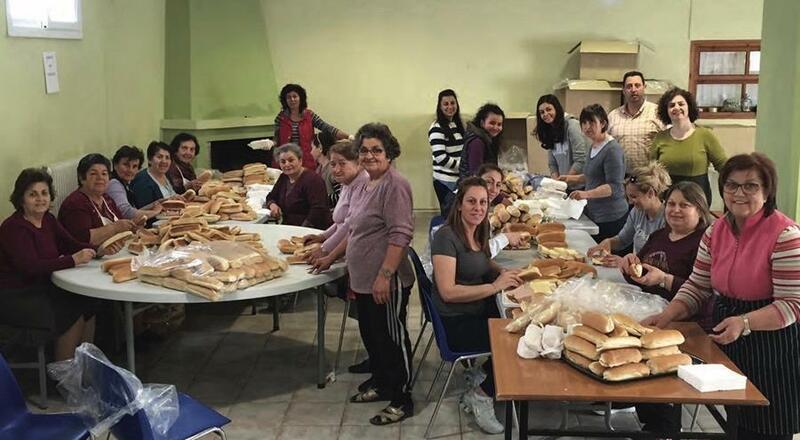 The church in this small rural town began to fix and provide sandwiches (often 1,000 at a time!) for the refugees who were living in tents. As the weather grew colder, they provided firewood to help them keep themselves warm outside their tents. One GEC elder, an electrical engineer, built a charging station for their phones and set up Wi-Fi so they could re-connect with family members who were behind or ahead. Soon the whole GEC was on board, participating both physically and financially. This ministry represents a significant expense (each sandwich supply trip to the border cost ~$1,500! ), but the Lord began to provide the funds through the gifts of many (including at least $18,000 from the OPC in 2016), and has continued to do so every step of the way in this journey of faithful service to the Lord’s command to love our neighbor, show kindness to the stranger, and protect the vulnerable. The positive witness to many Syrians, Iraqis, Afghanis, Iranians and others, many of whom may never have been exposed to Christians before, has been tremendous through the various ways in which “a cup of cold water" is being given in the name of Christ. But the impact in the lives of the believers who are responding to their Savior’s voice by doing unto others as they would have done to themselves has been immense as well. When the borders north of Greece closed and it became clear that no more asylum-seekers would be allowed through, there was suddenly a need to house families longer term. The GEC in Milotopos began renovations on several properties to make living quarters available. They now have 5 families housed. Not only are they providing the rent, utilities, and a good bit of their food, they are also taking them to appointments, helping them with the immigration paperwork, teaching the adults English, and providing tutoring for their children (some of whom have not had the opportunity to be in a school for as many as three years). This new form of ministry, while a more extensive investment, allows for the development of relationships. And through these relationships, the GEC has had the privilege of seeing at least one Muslim-background family profess faith in Christ. 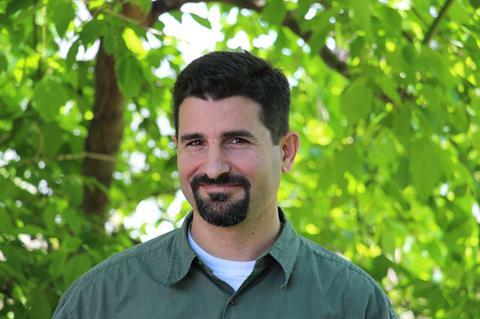 Sampach’s refugee trek was completed last year when he and his family were resettled in Spain. But how the Lord will use this Christian witness in and through our brothers and sisters in Greece remains to be seen. 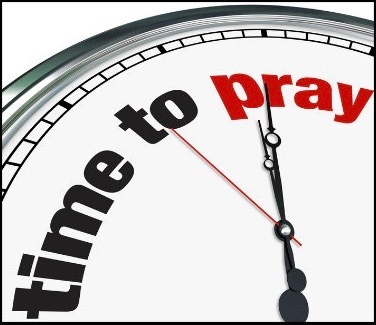 Some plant, some water, but the Lord in his time will bring the fruit. Soli Deo Gloria! Team Utah Filled for July 2017! 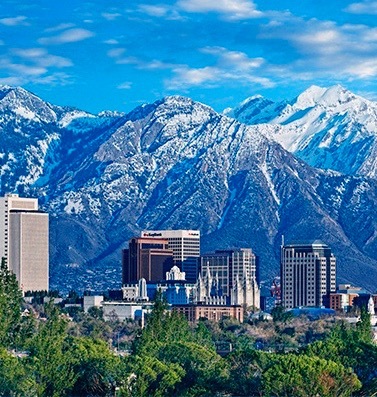 This is the 3rd summer that Faith OPC (Long Beach, CA) has organized a team of skilled volunteers to travel to Utah to help with church building renovations at Christ OPC in Magna! The team will also receive some training in evangelism to Mormons with Pastor Jason Wallace of Magna. Uruguay English Club Team Filled for July 2017! 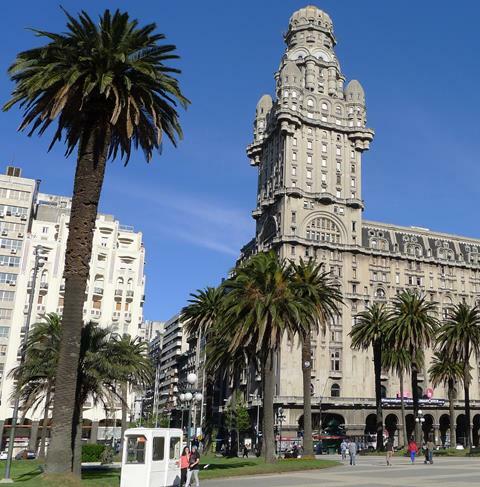 The Presbytery of Northern California and Nevada has organized a team of 5 volunteers to travel to Montevideo, Uruguay, in July to help the OP Uruguay Mission present an English Club for those 14 years and older during the local "winter" school break. Volunteers Installed Flooring at Neon OPC! 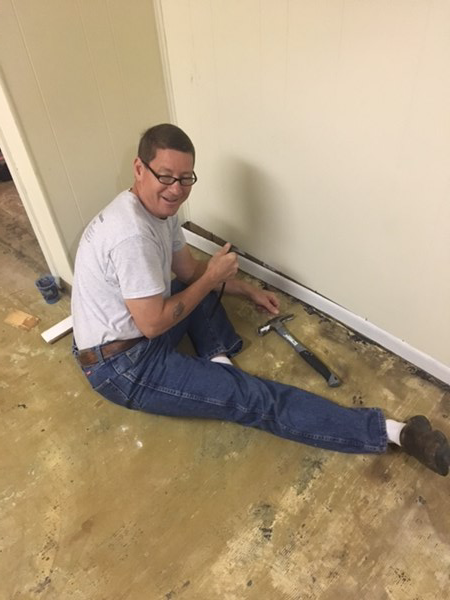 Many thanks to Jeff and Gloria Davis from Cedar OPC (Hudsonville, MI) who traveled to Neon, Kentucky, in April to install laminate flooring at Neon OPC! The congregation of this church plant has been greatly blessed by volunteers who have come from around the country to help them with renovations over the past four years. Pray for OPC Short-Term Missionaries! Pray for health and safety, boldness in witness, effective ministry, increased missionary vision, and spiritual growth for those participating in OPC short-term missions this summer! 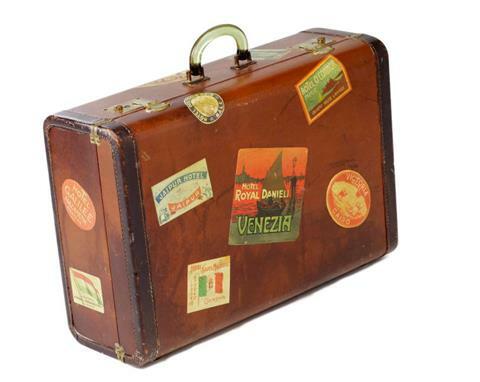 Reminder: If you are traveling overseas on a short-term missions trip this summer, you'll need to obtain Travel Medical Insurance! Grace OPC in Middletown, Delaware, is seeking a team to help them present their annual VBS. 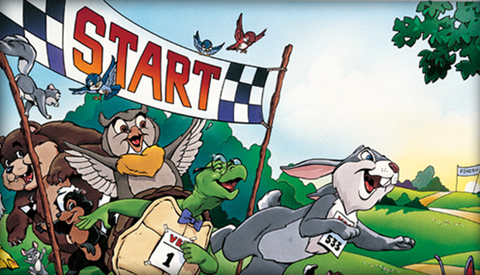 This year's theme is "The Race is On!" The VBS takes place from 9 to 12 each day, and accommodations will be provided by church families. Male and female adult leaders, as well as about 20 highly motivated teenagers and young adults, are needed on this year's "Venture Missions" team - a VBS outreach to children on the Menominee Indian reservation in the vicinity of Menominee OPC in Zoar, Wisconsin. Rev. 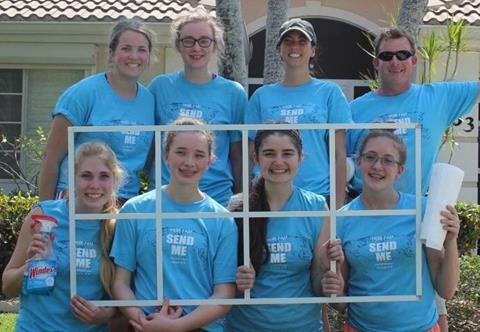 Eric Hausler of Christ the King OPC in Naples, Florida, welcomes a team of 8-16 people to come to Naples for a week this summer to participate in various outreach projects to increase the church's testimony in the local area! Summer 2017: Bring Your Team to San Antonio, Texas! Rev. 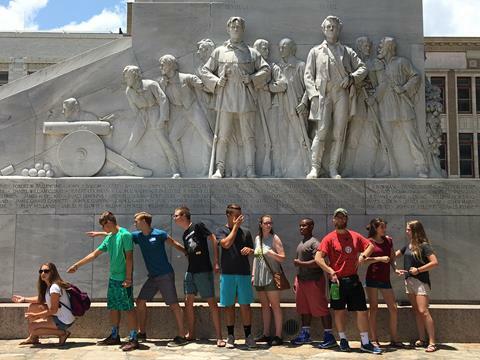 Andrew Moody of San Antonio OPC in San Antonio, Texas, welcomes a team of 8-16 people to come to San Antonio for a week this summer to participate in various outreach projects to increase the church's testimony in the local area! 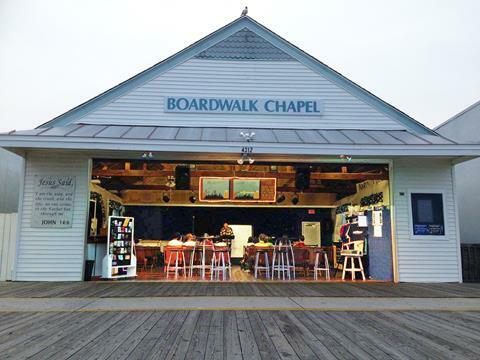 The Boardwalk Chapel still has openings for young men to join the summer evangelism team! End-of-summer staff to serve in August/September are needed. The weeks of July 1-8 and August 5-12 are still open for church groups to serve as Ministry Teams. 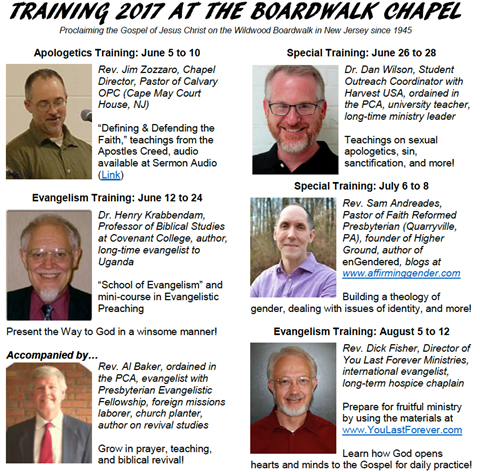 The Boardwalk Chapel in Wildwood, New Jersey, has announced its lineup of ministers who will provide training in Evangelism, Apologetics, and Gender/Sexuality Issues this summer. All are welcome to attend! 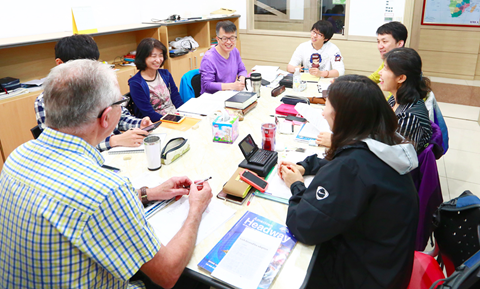 The Missionary Training Institute (MTI) in South Korea, founded by OP missionaries in 1983, is a residential community where missionary trainees live and study. Each year, they welcome volunteers from the U.S., U.K., Canada, and Australia to help them further develop their English speaking skills. 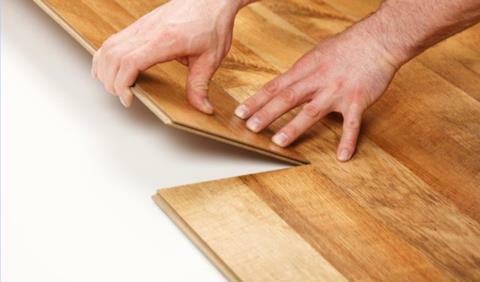 An experienced volunteer or team is needed to install 1,000 square feet of laminate flooring and molding at the Keys Evangelistic Ministries facility that houses Keys OPC in Key West, FL. 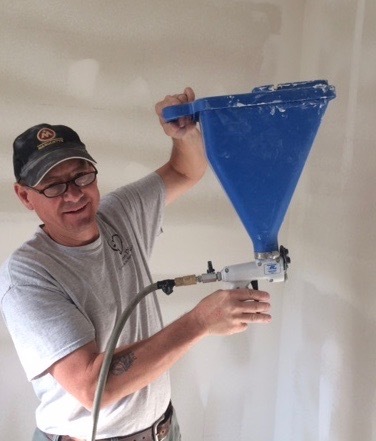 Shiloh OPC (Raleigh, NC) has generously supplied the funding to rebuild the master bath in the manse apartment at Neon OPC in Neon, KY.
A skilled volunteer or team is now needed to do the work! OP missionary Rev. 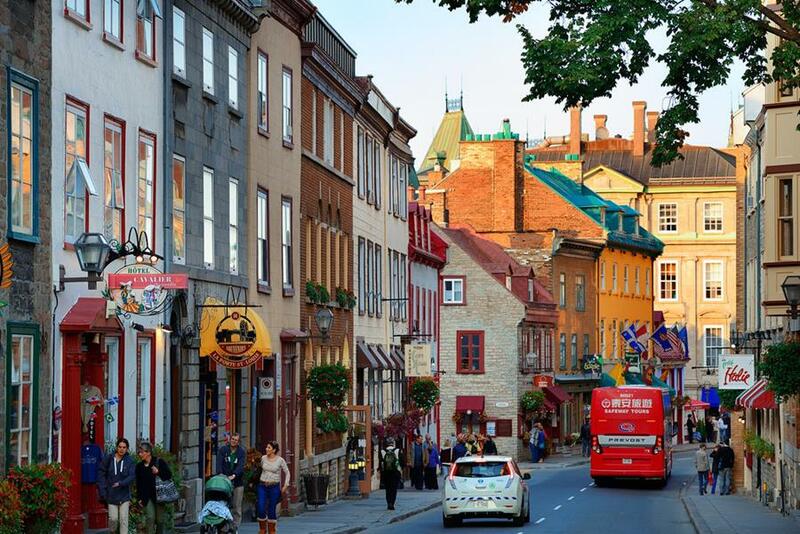 Ben Westerveld is currently seeking a young man or woman who desires to assist in the outreach and discipleship ministries of St-Marc's Reformed Church in Quebec City, where Rev. Westerveld serves as Pastor. What is a Missionary Associate? Click here to learn more about Missionary Associate service in the OPC. There are also openings for Missionary Associates on our fields in Asia and Uganda. 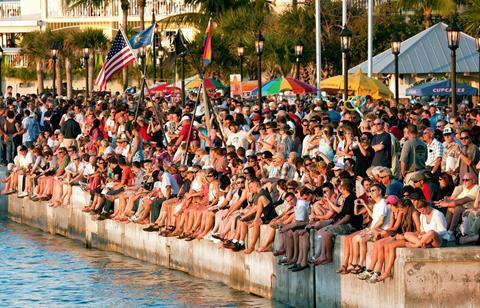 Bring your church group for a week of classroom training and practical experience in evangelism with Evangelist and OP Pastor, Bill Welzien, in beautiful Key West, Florida! 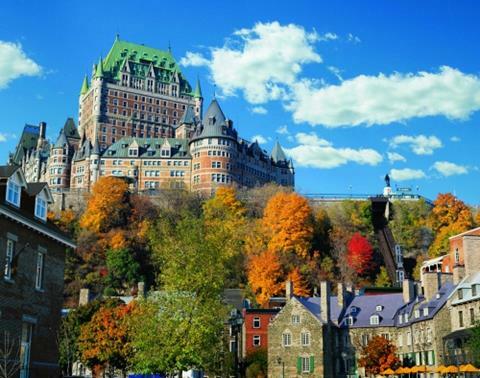 Join in a "Cafe Anglais" (English Cafe), a popular way for French-speaking citizens to practice their English in the parks and malls of Quebec City ! Great opportunity for outreach! 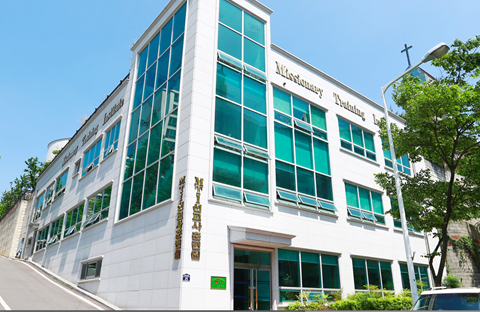 ESL Teachers are needed at the Missionary Training Institute in South Korea, to serve for 10-week semesters starting in September 2017 and November 2017! There are many different ways to serve on a short-term basis with the OP Uganda Mission year-round! Visitors always welcome! ​Making improvements to your church building?